On eBay of the Grant of Arms in 1907 to Evan Davies Jones is offered for sale (vendor Lee Burgess – diggerlee). In 1917 Evan Jones was created the 1st Baronet of Pentower. The title became extinct on the death of his son in 1952. His eldest and youngest sons were both killed in the First World War. Arms: Argent a lion rampant Sable collared and chained over the back Or on a chief arched of the second two mullets of the first. 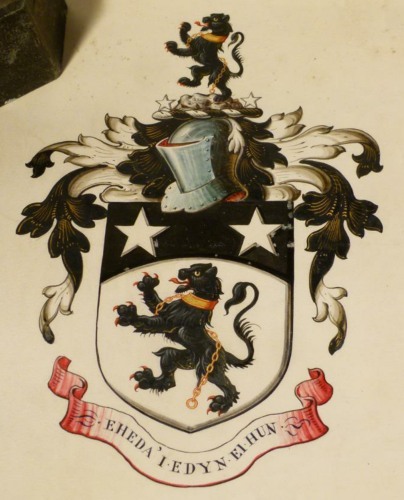 Crest: On a wreath of the colours upon a rock proper between two mullets Argent a lion as in the Arms. Motto: Ehed a’i edyn ei hun. 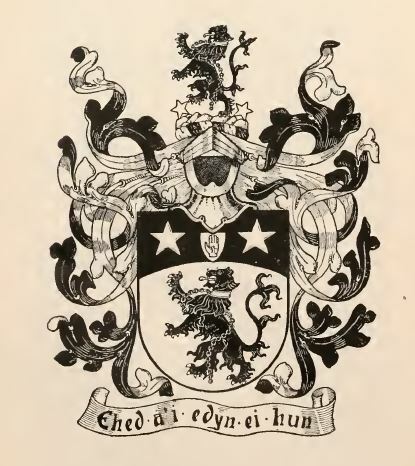 The Arms of Sir Evan Jones as displayed in the 1929 edition of Armorial Families. Update: As at 29th October 2016 this Grant is still on sale for £1,750.00.